Hello I am new to the forum and need some help. I am making some bottle openers using composite hockey sticks and I need to find a way to secure the opener in the stick. 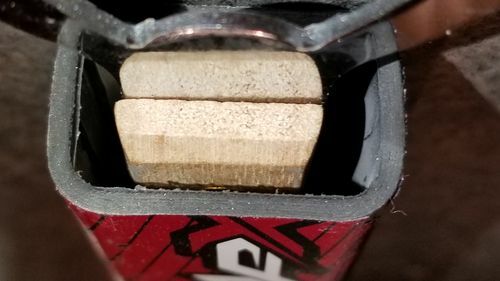 I was thinking of maybe cutting a piece of wood to put inside of the stick and then pour some quickrete in half way but I am worried it will be to heavy. I also have some gorilla epoxy but I think I would need to use lots and or use the epoxy and shove pieces of wood in as filler. Do any of you have any suggestions? Would a foam filler of some sort work? I will post some pictures to show you what the problem is. I am not totally sure what you want to do. foam would be great for filling part of the stick but it is not structurally very strong. You could fil the stick part way with foam then put in the wood and opener then pour in a slow cure epoxy to hold the wood and opener in. You will need to let the foam filler cure before putting in the other components. Forget the foam, that will prevent the epoxy from doing it’s job of providing strength and unity to the components. Tape the bottom so it doesn’t run out and fill the cavity with epoxy. - johnstoneb What type of epoxy would you recommend? And how strong will it be with the foam in there. I just want it so the opener doesn’t move around. The opener also has the wood on it fyi just in case you thought I put that on. I agree epoxy is the way to go. Forget Gorilla since it’ll cost you a fortune. You can get epoxy suitable for that for less than $75/gallon. Also, I’d get some black epoxy pigment. It’s up to you, but I think that would look better. The foam has no strength it is filler only. You want it below the wood and opener. Any slow cure epoxy will work. You want the slow cure so it will flow around and into any voids. Envirotex is one that would work. I use fishing rod finish. System one is available in quantities on line. I agree epoxy is the way to go. Forget Gorilla since it ll cost you a fortune. You can get epoxy suitable for that for less than $75/gallon. Also, I d get some black epoxy pigment. It s up to you, but I think that would look better. What type of epoxy do you reccomend? I do nor need a whole lot. What if I filled it a quarter full of quickrete or something similar? Do your best to clean out the inside of the stick. Maybe wrap a butter knife with a t-shirt rag piece and scrub the inside the best you can with denatured alcohol a couple of times. My dad suggests melting hot glue tubes in a pan and then putting them in there to secure the opener and then use the epoxy to strengthen the bond however I am unsure if the epoxy will bond to the glue. 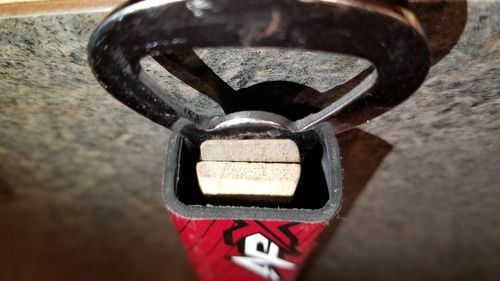 Since you only need the epoxy around the shaft of the opener and not all the way down to the bottom of the hockey stick put some sort of “plug” (piece of foam, wadded up paper, etc) in just below where the tang will reach. I would then use the two part auto/boat body epoxy putty to fill the hockey stick and then push the tang of the opener into the putty. The putty can be colored what ever you choose. Available in auto supply stores in small quantities. Why not take apart the opened part and build it a new handle the fits tighter into the hockey stick handle? +1 – rebuild the handle to make it larger so that large amounts of epoxy are not needed. Epoxy used as potting compound requires slightly different chemistry than normal laminating epoxy or surface coating epoxy used for wood working. Potting epoxy requires much slower cure rate, or least chemistry with very low self heating. If you fill existing space with 60 min cure epoxy, will likely get very hot during cure in about 15 minutes. If you use short 5-15 min cure, you would have smoke and swelling due massive exothermic reaction in a few minutes. So finding a way to reduce epoxy volume is good. There massive amounts of internet resources regarding different types of “potting compounds” that can be used in this application. 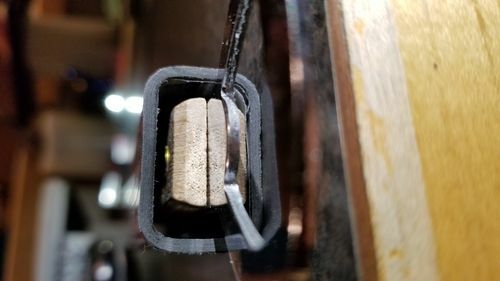 Most of the sources for larger known brand names (Loctite, Devcon, Hysol, etc) are higher cost industrial suppliers, but you can find lower cost potting materials on eBay.